Trained in Laparoscopy, Ultrasound, Managing High-Risk Pregnancy, And Normal Pregnancy, all Gynecological and bleeding problems, PCOS and infertility management, menopausal problems. Having 8 Years Of Clinical Experience. I would say Apollo Cradle is the best place to deliver your baby and carry your little bundle of joy home with a satisfied smile. Thanks to everyone at Apollo Cradle for making me cherish this dream. We had an amazing experience at Apollo Cradle, with the kind of support & care we received from everybody in the Cradle family. From the renowned doctors to nurses, front desk and housekeeping staff, I thank you all for your love & care. 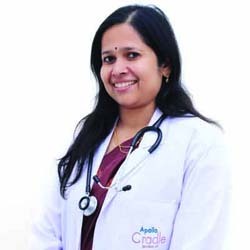 It was an awesome experience with Apollo Cradle. We were very happy with all the services. Our doctor, Jasmine Rath, nurses, front desk and housekeeping staff were extremely helpful, patient and considerate. Thank you to everyone.